by Amanda C. R. Clark, Ph.D.
Primary relics—such as articles from the passion or the bones of martyrs—were highly valued, wrapped in cloth with records of authenticity, and then displayed in a reliquary. These shimmering vessels of gold and silver, with delicate inlay and sparkling gems, were visually striking, placed on altars, carried in processions, and venerated on the feast days associated with the relic inside. They reflected the glow of inner faith hoped for by the viewer, and they remain visual beacons on our stormy journeys. The relic and reliquary are interdependent: the relic needed a worthy housing, while without the relic the reliquary was simply a vessel. Early reliquaries were seen as little tombs for the saints, but by the time of Charlemagne (d. 814) in the eighth century, personal reliquaries became popular as the faithful wished to be in close physical proximity to the sacred. Those able to make a pilgrimage to the Holy Land commonly wore a small neck flask to fill with various materials such as water from the Jordan River and soil from sacred sites. By the end of the tenth century the “speaking image” or “body-part” reliquary gained popularity. These came in many forms including figural statues, busts, arms, feet, hands, and fingers; they “spoke” because they told of what was inside, though ironically such reliquaries seldom housed the actual body part depicted. Regardless of the actual contents, the easily discernible body shape facilitated the experience of venerating the saint, whose spiritual virtues and intercession functioned to draw the faithful closer to Christ. Reliquaries were generally far larger than the relic within, and frequently had an aperture for viewing. 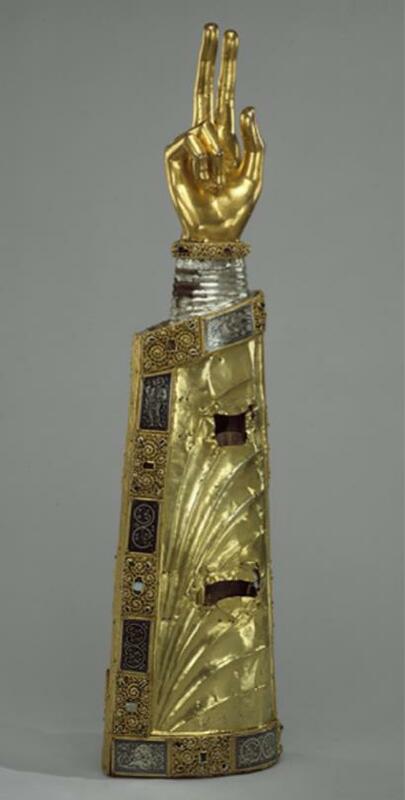 Lavishly embellished arm reliquaries were often produced during the thirteenth and fourteenth centuries, many coming from the Rhineland, far from the Holy See, the Holy Land, or other places of pilgrimage. These were a type of spiritual pilgrimage, a surrogate for physical travel. These arm-shaped reliquaries generally took two types of poses, either an open palm or a blessing gesture, the latter being particularly well suited to liturgical use. The blessing gesture reliquaries, with two fingers extended, anticipated the physical movement normally associated with the pose—even without physical movement one already sensed that a blessing was received. Some bishops even wore jeweled gloves in emulation of arm reliquaries, emphasizing the spiritual importance of their episcopal hands when blessing the faithful or ordaining new priests. Conversely, arm reliquaries were often fitted with mock liturgical gloves and bishops’ rings to imitate the particular blessings reserved only to bishops. Just as a priest was vested in his garments, so too the relic was vested in the reliquary surrounding it, and in some cases the ornamented arm was “dressed” in a manner reminiscent of liturgical vestments. 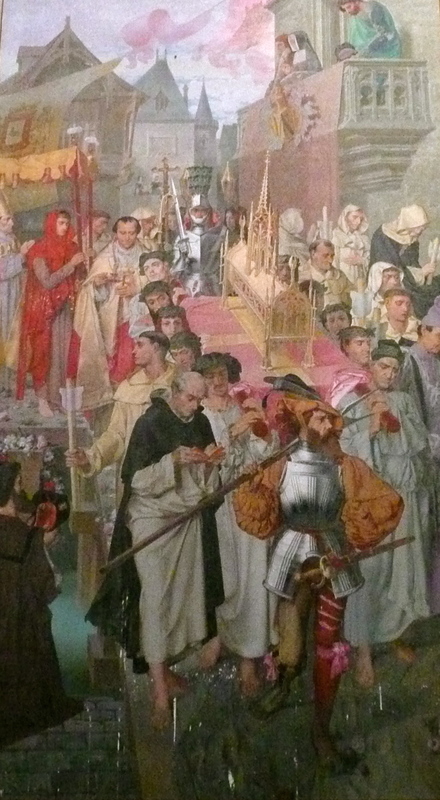 Some medieval bishops modeled the design of their own vestments after the decorations on the arm reliquaries they held in high spiritual esteem; then they would animate the arm reliquary in making the sign of the cross over the people. It was a symbiotic visual splendor, which expressed the sensibility of both the Eastern and Western Churches to animate both soul and body in spiritual worship and veneration. The saint’s intercessory power and holy nature remained available through prayer and veneration of the relics. But why decorate these reliquaries so extravagantly when the saints themselves often lived austere lives? The medieval French Abbot Suger (pronounced sue-zhay, 1081-1151) noted that if gold had been a material worthy of pagan gods, it was certainly worthy to be used in service of the Christian God. Thus, since the power of the relic (and the saints) was seen as coming from God, the reliquary became a means of transmitting spiritual favor—the shimmer of precious materials reflected the light of God. Having a profound need for sensory experience, the jeweled, gilded, ornate attributes of the reliquary, or the vestments, are an aesthetic event that lifts the mind to greater heights—a temporal wealth seen as a metaphor for divine riches. Visual splendor, rather than viewed as extravagance, was associated with heaven. The opulence of the reliquary could be seen as commensurate with the sanctity of the saint; and the bejeweled arm appeared as if it were clad in a heavenly garment. Spiritual beauty had been transformed into a physical, temporal beauty. Bishop St. Martin of Tours (316-397) is recorded as having light that radiated from his “miraculously bejeweled and golden hands,” a beaming light that even penetrated sunlight. The gold and silver materials that would shape arm reliquaries, such as the one made for a relic of Saint Martin, sought to capture this sense of radiating holy light. Abbot Suger encouraged the use of precious materials so that reliquaries would shine just as the venerable saints shone in life, “radiant as the sun.” Suger hoped that the physical brightness of an object would lead the soul to spiritual brightness. A luminous vessel was therefore desired, though it held no power of its own; similar to the saint, it was a transmitter of Divine power, transmitting the power of God, not their own. Signifying the glory of God, the relic and reliquary offer a tangible and physical manifestation of the intangible. When viewing a bust or arm reliquary we sense the authenticity of the relic as part of a physical body—no longer merely a conceptual idea. As God was incarnate, these saints, too, were real persons, still present in memorial form. 1. Victricius of Rouen, “The Martyr and His Relics,” in Christianity and Paganism, 350–750, ed. J. N. Hillgarth (Philadelphia: University of Pennsylvania Press, 1986), 25-26. 2.Kinga Szczepkowska-Naliwajek: “Reliquary, Christian: Introduction,” The Grove Dictionary of Art, online edition, http://www.groveart.com, n.p. 3. Barbara Drake Boehm, “Body-Part Reliquaries: The State of Research,” Gesta 36, no. 1 (1997): 11. 4. Cynthia Hahn, “The Voices of the Saints: Speaking Reliquaries,” Gesta 36, no. 1 (1997): 20-21. 7. Erwin Panofsky, Abbot Suger: On the Abbey Church of St.-Denis and its Art Treasures, 2nd edition (Princeton: Princeton University Press, 1946), 16. 10. “The Martyrdom of Polycarp,” trans. Maxwell Staniforth, in Early Christian Writings: The Apostolic Fathers, rev. ed., trans. Andrew Louth (London: Penguin Books, 1987), 131. 11. “The Martyrdom of Polycarp,” 131.